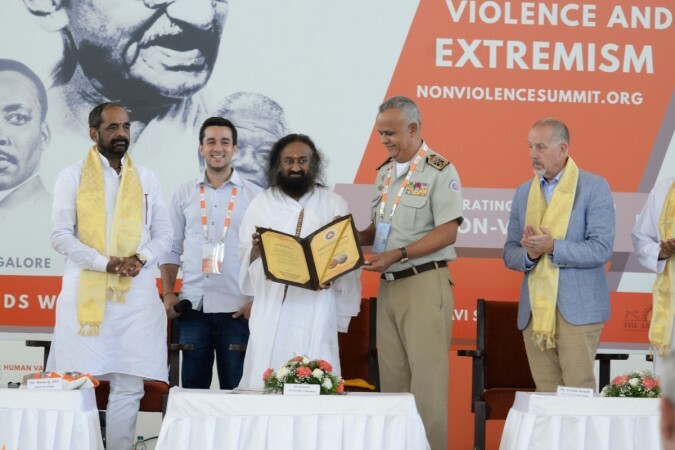 The Brazilian Government conferred Sri Sri Ravi Shankar with the title of 'Friend of Military Police of Brazil', as more than 1,000 military officials have benefited by Art of Living's meditation workshops. 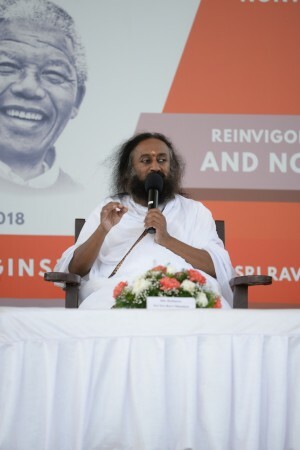 Marking Mahatma Gandhi's 149th birth anniversary, global humanitarian and peacemaker, Gurudev Sri Sri Ravi Shankar, founder of The Art of Living, emphasised the need for people to recognise the universal values that connect everyone in spite of the religious and cultural diversity in the country while speaking at world summit on countering violence. The event was organized by The Art of Living's sister concern International Association for Human Values along with the From India With Love Project at the Art of Living International Center in Bengaluru. The Brazilian Government today conferred Gurudev with the title of 'Friend of Military Police of Brazil', as more than 1,000 military officials have benefited by Art of Living's meditation workshops. "Violence free society, inhibition free intellect, trauma free memory, sorrow free soul is the birthright of every individual," said Gurudev Sri Sri Ravi Shankar. He is said to have convinced the FARC about the strategic importance of following Gandhi's principles of non violence, that played a crucial catalyst in ending the 53-year old civil conflict between FARC, one of the largest left-wing guerilla movement, and the Colombian government. Gurudev has also been actively involved in helping resolve long-standing conflicts and provide crucial post-conflict trauma relief and rehabilitation in areas such as the middle east, Colombia, Kosovo, Lebanon, Syria, Africa, Pakistan, India's northeast and Kashmir. "We need to help people see beyond their prejudice. We all talk different languages and our cultures are different and so are our ways of worship. Spirituality is recognizing universal values and diversity that exists in our creation." The conference played host to the likes of Dr. Frank Straub, and Dean Esserman from the National Police Foundation, Dr. Makarand Paranjpe, Director, Indian Institute of Advanced Studies, Dr. Joseph Smith, Mayor of North Miami, Charlie Allen, Institute for Economics and Peace and other lawmakers, peacekeepers, researchers and thought leaders. "In my 35 years of careers as a police officer, I have seen terrorism, separatism of all shades," said Padmashri Prakash Singh, former DIG, UP Police, "I believe from experience that corruption is common thread that runs through most of the problem which leads to bad governance leading to discrimination, exploitation, unequal growth which is a cause for frustration, anger and unrest." "As Gurudev had mentioned in one of his speech that solution for this is education which is multilingual, multiracial, mulitctural, multireligious so that once you know about other people, other denomination and thoughts you develop respect for them, and resulting in proportion of conflict will go down," he added. The conference began with emphasizing the power of inner peace in creating sustainable peace in the world around us. The need for peace activism was also emphasized. Experts shared their unique perspectives to the complexities and nuances of creating a world of non-violence. They discussed the causes of strife ranging from religious dogma to repression, shared personal stories of how witnessing violence led to a resolve to make a difference and explored how conflict goes beyond what's visible and obvious. Delegation dove deep in the solutions part of the conference- interfaith dialogue, protecting women and children, strategies for gang interventions, preventing recidivism in correction centres among others were discussed.